SEEKING A FRIEND FOR THE END OF THE WORLD. Having seen the trailer for this something like a hundred times in the last few months, I was poised to dislike the movie. Either in spite of or due to this reactionary tendency, I found myself almost immediately disarmed. This feeling of mild but thorough approbation carried through to the end. Seeking a Friend takes us through an asteroid end-of-days scenario as lived by a sweet, luckless everyman named Dodge (Steve Carell). In the face of the impending cataclysm, Dodge's wife literally runs off, leaving him alone to contemplate a lifetime of missteps. True to his name, he's engineered escape strategies to keep from making tough decisions. This "name as descriptor" bit is one of the devices writer/director Lorene Scafaria deploys at risk of preciousness-overload. Somehow the charm and big-heartedness of the story win out, though. 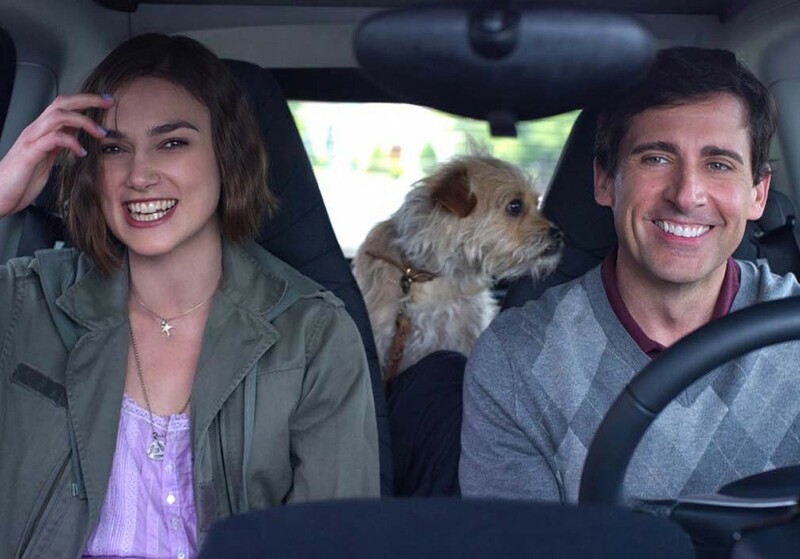 Into his life stumbles Penny (Keira Knightley), a serial monogamist with hyper-somnia and a wee-habit. Fleeing riots, they set out on a sketchily planned adventure toward reunion: he with a lost love, she with her family in England. The plot goes the way of all romantic road movies, but there are enough clever asides and well-placed cameos sprinkled throughout (Patton Oswalt, Gillian Jacobs and William Peterson, especially) for me to forgive the predictability. Carell and Knightley muster up some cute, generally believable on-screen chemistry. He's possessed of a self-effacing charm that makes him hard not to like. And with him as straight man, she gets the chance to play the lovable oddball, which is a welcome departure for her. As they move through their adventure, the relationship between them grows and deepens, and Dodge gradually opens up a little. Again, no surprises as to where that strand goes, but the warmth and compassion of the performers make the dynamic work. While the structure of the narrative comes right out of the rom-dramedy playbook, there is an intelligence and originality to the writing that sets Seeking a Friend apart from the rest. There's room for honesty and black humor, and in the end Scafaria doesn't shy away from the hard truths. Not to say this is the final word on final days, but it amounts to more than the sum of its parts. R. 100m. BRAVE. Before I go any further, I have to say Brave looks as good as any animated movie I've ever seen. Pixar's animators, not surprisingly, have outdone themselves once again. They created an immense, gorgeously detailed, mythical version of Scotland that speaks to the kid in all of us (I'm assuming we all have a kid inside who wants to live in a castle). The characters come to exuberant life on the screen, underpinned by themes of self-reliance, family and gender equality. But the story itself lacks the certain something, the spark of extra imagination that distinguishes the truly great Pixar offerings from the merely good. Kelly McDonald gives voice to Merida, the fire-haired tomboy princess of the aforementioned Highland kingdom. She has come of age and tradition dictates that a suitable spouse be selected for her. But Merida, anything but a slave to convention, has other plans. She revels in her freedom and exploration and refuses to be shackled by an arranged marriage. So she finds a witch, casts a spell on her mother that unexpectedly turns her into a bear, and must find a cure before the change becomes permanent. Along the way, she's called upon to defuse tensions between her father and the neighboring clans and defend herself against another, less loving, magical bear. About a third of the way through it becomes very clear how the narrative is going to be resolved. At that point, I found myself unintentionally checking out. Not that I didn't care anymore, but with the ending in plain sight the stakes were lowered and my investment in the characters diminished. A brilliant supporting cast (Robbie Coltrane and Emma Thompson, among others) is pushed to the fringes of a script that focuses completely on Merida, only letting the rest of the characters chime in for minor comic relief or to advance the plot. Brave adheres so closely to storytelling convention and an often-retold story that the truly amazing visuals become almost forgettable. The action clips along briskly, but the story is ultimately too well worn and shallow to distinguish itself. PG. 93m. ABRAHAM LINCOLN, VAMPIRE HUNTER. With apologies to its fans, the idea behind this movie strikes me as half-baked, even dumb. The premise: Honest Abe sees his mother killed by a vampire and seeks revenge. Without training, he doesn't stand a chance. Enter dark stranger Henry Sturgess, who provides training, discipline and assassination assignments. Abe becomes an axe-wielding killing machine. Then Abe becomes president. Turns out the vampires control the American south, advocating for slavery as a food-source, of course. Seems like awfully low-hanging fruit, in terms of storytelling. But that's all well and good: This is a revisionist fantasy, and if it were well executed I'm sure I'd enjoy it as much as anyone. But the action sequences are mishandled from the beginning, trading creative camerawork or fight choreography for hackneyed slow-motion bloodletting. And by the time we meet Lincoln as president, I found it impossible not to focus on his pancake age-makeup. Throw in an unfocused, badly edited climax, and there you have it: no fun at all. R. 105m. MOONRISE KINGDOM. The latest from arty auteur Wes Anderson is a magical tale of two adolescent lovers (Jared Gilman and Kara Hayward) who run away together in '60s New England. PG-13. 94m. MAGIC MIKE. Beefcake with ex-male stripper Channing Tatum as a veteran male stripper mentoring a young stud (Alex Pettyfer) new to the game. Hard to believe, but it's directed by Steven Soderbergh. R. 110m. PEOPLE LIKE US. Chris Pine attends his dad's funeral and is tasked with delivering $150k to a troubled older sister (Elizabeth Banks) and a nephew he didn't know existed. Expect ruminations on the meaning of family. PG-13. 115m. TED. Seth MacFarlane's big screen debut as writer/director and voice of a slacker Teddy bear named Ted owned by John (Mark Wahlberg) whose childhood wish for his stuffed toy to come to life came true. Trouble is, the bear doesn't want him to grow up. R. 106m. MADEA'S WITNESS PROTECTION. Writer/director/producer/star Tyler Perry is back in drag as Madea, this time helping protect a banker involved in a Ponzi scheme who is testifying against the mob. PG-13. 114m. THE AMAZING SPIDER-MAN. "Reboot" of the Marvel/Stan Lee franchise reintroduces the web slinger as a skater dude teen (played by Andrew Garfield) exploring his family history, discovering his superpowers and fighting an evil villain (Rhys Ifans). Yes, it's in 3-D. PG-13. 136m. Arcata Theatre Lounge's Sci-Fi Pint & Pizza Night on Thursday has a pair of rocket-powered Cold War era flicks: Designation Moon and Rocket Attack U.S.A. Saturday the ATL has Random Acts of Commentary with the Random Acts of Comedy improv troupe offering Mystery Science Theater-style wisecracks for random and classic videos. Weird weather getting to you? It's weirder in the CGI kid comedy Cloudy With a Chance of Meatballs, showing Sunday at the ATL. You can see prestigious award-winning films at the Prestige Film Festival on Saturday at the Eureka Theater where organizers "provide a spotlight for filmmakers and production companies who are looking for public recognition of their creative efforts" in 90 some-odd categories, provided they pay the $75 per award entry fee (actual award for your mantle not included). BERNIE. True story, stars Jack Black as a Texas mortician who murders an unpopular widow (Shirley MacLaine) and finds the townsfolk rallying to his defense. PG-13 104m. THE BEST EXOTIC MARIGOLD HOTEL. British retirees (Judi Dench, Maggie Smith, Bill Nighy) head for India, where the indoor plumbing isn't quite up to snuff. PG13. 124m. MADAGASCAR 3: EUROPE'S MOST WANTED. Top-notch voice talent and clever sight gags distinguish the continuing slapstick adventures of goofy zoo fugitives. PG. 85m. MEN IN BLACK III. Will Smith is back as Agent J, the smack-talkin' government agent sent to dispatch diabolical aliens. PG13. 107m. PROMETHEUS. Ridley Scott's prequel to Alien (or is it?) features breathtaking visuals and strong performances, especially Michael Fassbender's as an android with the mannerisms of Lawrence of Arabia. R. 124m. ROCK OF AGES. Maudlin, humorless hair metal Broadway musical about a rock club sports an all-star cast including Tom Cruise and Alec Baldwin. PG13. 123m. SNOW WHITE AND THE HUNTSMAN. This visually stylish adaptation of the Brothers Grimm tale suffers from an underdeveloped plot. Plus, the dwarfs aren't even real! PG13. 127m. THAT'S MY BOY. The latest crude yet sappy comedy from Adam Sandler delves into the eternal father/son bond. R. 114m.